Yesterday I was browsing the web on my Playbook looking for Android apk's and bar's. While I was on one site don't remember which site it was but it gave me a link to download the app but while I was scrolling down the site I accidentally clicked on the download link and it tried downloading the Android app to my Playbook, but of course it couldn't and gave me a notification that the downloaded was unsuccessful. So I was like yeah that's fine. Since then I have been getting the same notification every couple of hours. It's getting annoying its going almost an entire two days now. Can somebody help? Last edited by BonezH2X; 02-25-12 at 12:27 AM. anon(3896606) and gts02 like this. i think i fixed it i just tapped on it just now and for some reason it took me to the android player by itself and took me to a downloads thing and is saw the android thing it was trying to dl and i checked it off to be deleted its fine now. I'm getting this issue at the moment, I'll try what you suggest next time it happens. Mine keeps wanting to download a battery upgrade of some type. I'm hoping an OS update will fix this. What do you want this OS update to do? The issue is not with the OS, but rather with an application you installed. Uninstall android apps one by one until the notification goes away. I fixed my notifications by installing ghost commander from app world, then in the left pane chose apps, then found the downloads app, then chose "shortcuts" tapped the shortcut that appeared, launching the downloads app. From there I deleted the failed downloads and the notifications have stopped now. No need to uninstall any apps, unless they keep retrying the downloads even after deleting them manually. EDIT: A slightly easier method: Get "Quick App Manager" from the App World, run it and it should show icons for all Android apps. Tap "Downloads" (icon is a green square with a white downward arrow) and then "Open". From there delete the failed downloads. Less taps required to get to the Downloads app this way than via Ghost Commander, but that's the only difference. Ghost Commander is still a more useful tool overall IMO, especially now that it is optimised for PB usage. Last edited by SifJar; 10-19-12 at 12:25 PM. battery, genesis123, Icarus3000 and 33 others like this. SifJar's solution using the left pane of Ghost Commander worked! I had already tried looking in the downloads folders on the right side without success. So relieved to have quiet tablet again. Thanks a ton - the messages were driving me nuts!!! Wow thanks so much, it worked!!! I constantly get"1MobileMarket_z.apk Download Complete" notifications. I think it's this GlassBlast app I have, but haven't been irritated enough to do any troubleshooting. I did do some poking around after dloading Ghost Commander from this thread's advice, but I'm not seeing whatever it is that I need to stop this one. Thanks so much for this fix. I had a similar problem and it was driving me crazy, this fixed it. I was hours away from a security wipe - Nice job. Likewise for me - thanks, SifJar - those notifications were driving me crazy and I thought a security wipe was the only answer. You just saved me a couple of hours! Ghost commander is not showing anything out of the ordinary to delete for me to solve this. The original app is gone but somehow the request remains. Is it a download notification you are getting or some other app notification? The only ones I've had that have persisted are failed download ones, which I can fix using the method I described. Try launching the Android "Settings" app via Ghost Commander and see if you can find the app through the "Manage Applications" option there, to make sure it is definitely gone. Finally cleared this notification away with ghost commander. I was just learning to live with it but finally tracked it down with GC and deleted the darn thing. Thanks so much sifjar. No problem, glad to be of assistance. 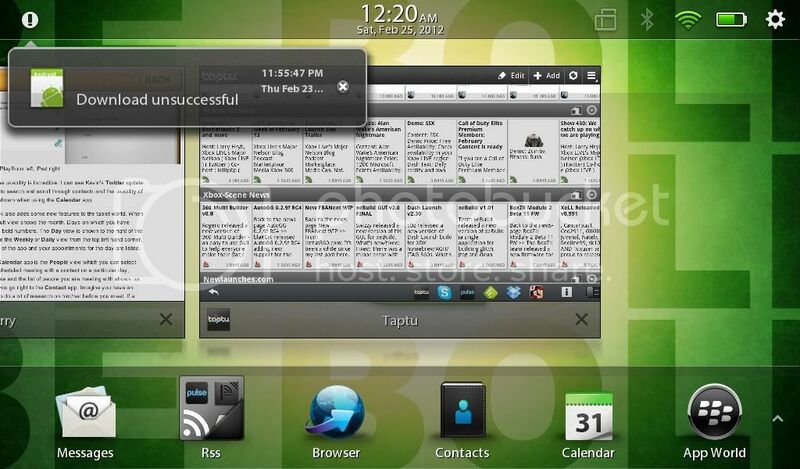 It's an Android file manager that is available for Playbook through the App World (i.e. it is "officially" converted by the devs), which has a couple of extra features e.g. being able to load apps, including ones normally inaccessible. Would I risk a "if you sideload [unknown sources] you can't really know what's going to append next" ? Oh no ! This would be a very grumpy advice and a proof of my antic age.